We offer bankable wind resource and energy yield prognoses, starting with data processing, evaluation, correction and finishing with bankable reporting of energy yields, including P50, P75, P90, P95 levels of confidence, assessment of losses and a vast assessment of uncertainties involved. During data correction and uncertainty analysis we consider in-depth correction of measurement data with respect to influences that the sole physical presence of the mast causes (e.g. mast blockage, wake effect, speeding-up, lighting rod etc.). On the way we perform advanced statistical analyses to fill data gaps in case sensors failed or the measured time series contains data gaps or errors. This reduces data uncertainty and yields in results with higher accuracy based on higher data availability. It lowers the need to exchange sensors, if a sensor shows malfunction, and as long as sufficient other sensors (preferably redundant) still maintain operative. Each corrective action taken will be evaluated and the uncertainties of such procedures will accordingly be taken into account following ISO / IEC 61400-12-1:2005 and ISO / IEC Guide 98-3:2008 (BIPM) „Guide to the Expression of Uncertainty in Measurement“ (GUM). To further control and reduce uncertainties, a lso-called in-situ test of installed anemometers should be performed. This in-situ test is a advanced cross comparison of anemometers and permits estimation, if (re-) calibration of sensors is needed already or can be surrendered to a later time. The recalibration intervals and thus exchange of sensors can be postponed by this method, saving time and costs, and on top yielding low uncertainty related to the sensors by permanently maintaining valid calibration characteristics. The cleaned, filtered and corrected set of measurement data subsequently need to be correlated with at least one independently verified and representative long-term valid wind regime. Our applied procedures guarantee most accurate prognosis results for the derived long-term wind climate and hence yield highest level of precision at low levels of uncertainties. 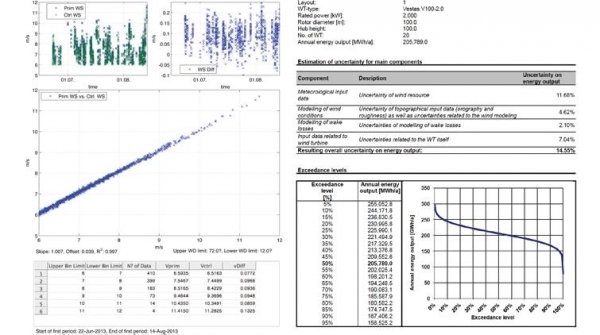 Appropriate energy yield optimization starts with optimized wind turbine locations in relation to the long-term wind resource probability (wind speed frequency distribution and wind direction distribution), topography and precise wind turbine characteristics (type of power curve, cut-off hysteresis, operational mode, etc.). Thereby a micro-scale wind resource raster (wind map) is an optimal tool to localize most promising wind turbine positions within an objected planning area and to yield an optimal level of energy generation on long term. We offer site-specific wind mapping services with very high resolution, enabling our Clients to energetically optimize a wind farm project by determination of the precise location of each single wind turbine within the wind farm. We hereby rely on linear as well as CFD models, depending on the site characteristics. Validation of the prognosis results and determination of the level of uncertainties and assessment of the quantiles of probability for each wind turbine individually result in a bankable wind energy yield prognosis, entirely respecting our accreditation as testing laboratory regarding Wind Resource and Energy Yield Assessment of Wind Turbines (incl. Assessment of Losses following TR6 Rev.9) following ISO / IEC 17025:2005.